Thomas James Vilsack (born December 13, 1950) is a former Governor of Iowa and a former Democratic candidate for President of the United States. Vilsack was the U.S. Secretary of Agriculture from 2009 to 2017. 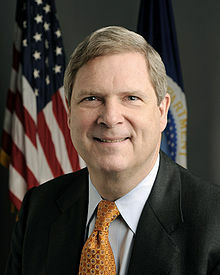 Vilsack was born in Pittsburgh, Pennsylvania. At college, he met and married his wife, Christie. They moved to Iowa after graduation. They have two children. Vilsack served in the Iowa State Senate before he ran for governor in 1998. He won that election and the next one in 2002. He chose not to run again in 2006. In December 2006, Vilsack said he would run for president. He dropped out of the race a few months later. He endorsed New York Senator Hillary Clinton. This page was last changed on 1 July 2017, at 06:58.